A year ago, the World Health Organization (WHO) released its first global report on antimicrobial resistance, revealing a number of troubling trends: rising rates of resistance to first-line antibiotics for common infections such as urinary tract infections, gonorrhoea, and staph infections; a growing inability to treat deadly diseases like tuberculosis (TB) with second-line and even last-resort medications; and higher rates of drug resistance observed in the treatment of malaria and HIV. Indeed, with the rise of treatment-resistant pathogens —including bacteria, viruses, fungi, and parasites—the world is not only on the brink of a “post-antibiotic era”, but also in danger of seeing existing antiretroviral, antifungal, and antimalarial medicines be rendered ineffective. In a recent report, the WHO found that as many as 75% of countries do not have established plans for fighting antimicrobial resistance. The report emphasized the importance of strong health systems in the ability to fight AMR, placing special focus on tackling the inappropriate use of medicines, otherwise known as irrational medicine use. The irrational use of antimicrobials is a key driver of AMR, and has been widely recognized as a barrier to success in the global fight against treatment-resistant microbes. What makes antimicrobial use “irrational”? Despite efforts by global health policymakers to stress the importance of RMU to health professionals and patients around the world, irrational use remains a major challenge. A 2011 report estimated that more than 50% of medicines are prescribed, dispensed, or sold inappropriately, and that around half of all patients fail to take their medicines correctly. Antimicrobials are among the most widely misused groups of medicines. The prevalence of irrational antimicrobial use can largely be attributed to weaknesses in health systems, including a lack of treatment guidelines and formularies, poor or non-existent monitoring of medicine use, and the absence of locally relevant educational efforts. The importance of a strong policy and regulatory environment, therefore, cannot be underestimated. A strong health system can lay the foundation for rational prescribing and dispensing of antimicrobials, encourage better education for both health providers and patients, and help ensure the availability of appropriate, quality pharmaceuticals. Managerial actions, such as publication and regular monitoring of standard treatment guidelines for health professionals. 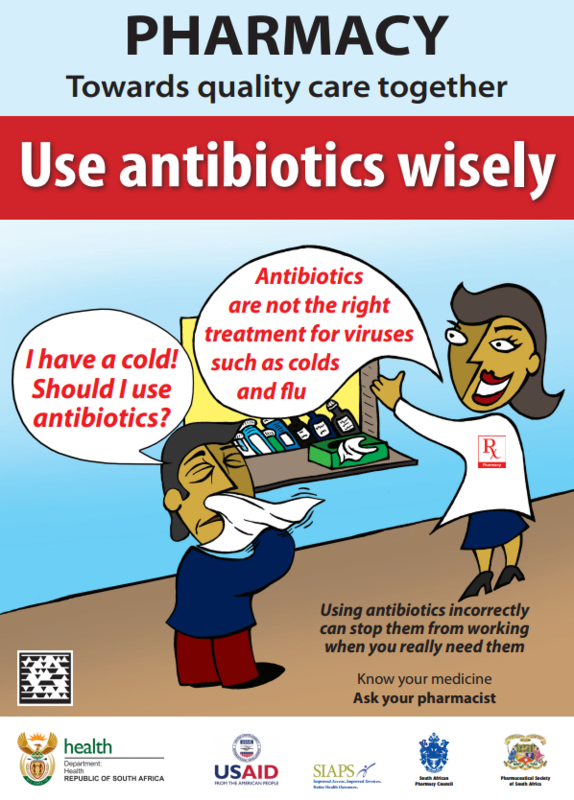 Educational actions, such as improving training on RMU and antimicrobial resistance for medical and pharmacy students, as well as practitioners, to discourage inappropriate prescribing, dispensing or sale of antimicrobials. Public and patient education, including community- or facility-based programs, is equally important for increasing awareness of the dangers of self-medication, pill-sharing, and other irrational antimicrobial use behaviors. Regulatory actions, such as the establishment and enforcement of regulations for pharmacies to prevent the sale of antimicrobials to patients without a prescription. A poster to educate the South African public on RMU. 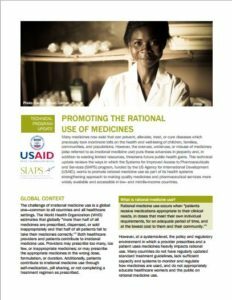 The USAID-funded SIAPS Program employs these strategies in its systems-strengthening approach to promoting the rational use of antimicrobials and other medicines. In Ethiopia, for example, SIAPS supported the publication of standard treatment guidelines which provide up-to-date diagnosis and treatment information for practitioners nationwide. 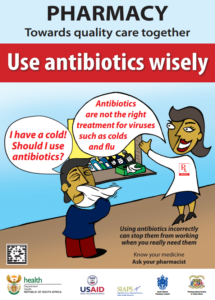 We’ve also helped to launch public education campaigns to raise awareness on antimicrobial resistance in Ethiopia and South Africa, and assisted the University of Namibia’s School of Pharmacy in training a new generation of pharmacists to help promote rational medicines use. Additionally, we have strengthened the medicines registration process in the Democratic Republic of the Congo to ensure quality medicines are being used in the treatment of diseases. Many SIAPS RMU activities play a role in initiatives to fight the world’s most deadly diseases: TB, HIV, and malaria. A manual for performing drug use reviews, for example, aims to help national TB programs ensure the rational use of anti-TB medicines, which will contribute to USAID’s goal of protecting communities from infectious diseases. The training of community health workers in Burundi, meanwhile, is helping to ensure more accurate diagnosis and better treatment of malaria in young children, thereby working toward the USAID goal of ending preventable child and maternal deaths within a generation. SIAPS has also assisted partners in Namibia to monitor early warning indicators for HIV drug resistance and support treatment adherence, thereby prolonging the efficacy of existing ARVs and helping to work toward the common goal of achieving an AIDS-free generation. By working with its partner countries to encourage RMU, SIAPS is building awareness of the role irrational medicine use plays in driving antimicrobial resistance—and promoting important strategies for fighting this major threat to global health. Find out more about our RMU activities.